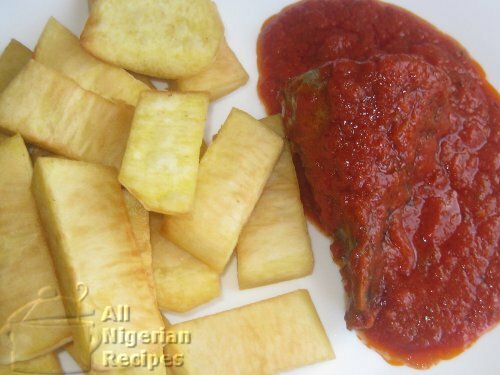 Fried yam is a deep-fried yam recipe that can be eaten with a wide range of Nigerian stews and sauces. It is fried in such a way that the outside of the chips is crunchy while the inside is moist. White puna yam: as much as you can eat. Peel and cut the yam tuber into 1 inch cylindrical discs. Make several cuts across the discs to get large chips. Wash the yam chips and place in a bowl. Add a little salt and toss the contents to distribute the salt. If you are using a deep fryer, pour enough vegetable oil into the fryer as per the instructions manual and preheat the oil to 170°C. You can also use a pot to fry the yam chips. It is preferable to use a pot rather than a frying pan for this fried yam recipe because pots provide more depth for the frying process. When the oil is heated, add a few yam chips, leaving enough room for flipping the chips. Stir the chips till they have turned golden. Remove the chips and place in paper towels to absorb the oil. Fry the rest of the chips following steps 4 through 6. The video below is for the popular Nigerian street fried yam.